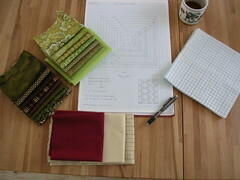 Made the designs and collected the fabrics to begin to make this log cabin quilt. It's a fun project, since it's for a baby, and a challenge because the colors were not my choice - the mom to be sent me swatches of the wall paint and curtains, and that's what I had to work with in terms of chosing the fabrics. The colors are not the typical baby pastels - I'm not a fan of "baby fabrics' in general, and I was worried that the colors would be to dark or heavy. Mixing olive green in with the chocloate brown, adding stripes and polka dots added light and sparkle. This photo was taken a while back and in the meantime I'm putting the top together. It's a lot of fun seeing it come together like this!